What is a “visitor side metered parking zone”? These are generally the east and south sides of the street in permit parking zones where visitors without a valid parking permit may currently park for free for up to four hours. These four-hour free parking zones for non-permit holders will become “visitor side metered parking zones,” which will require non-permit holders to pay to park for up to four hours. If I have a valid resident permit, do I need to pay for parking in these new visitor side metered parking zones? No, residents with valid parking permits issued by the Hoboken Parking Utility are exempt from paying for parking in visitor side metered parking zones and may continue parking in visitor side metered parking zones for free for an unlimited amount of time. What is the purpose of having these visitor side metered parking zones? As we all know, on-street parking capacity in Hoboken is very limited, especially in permit parking zones. One of the primary goals of the visitor side metered parking zones is to generated more turnover from visitors to help improve parking availability for resident permit holders. Revenues generated from visitors paying to park in visitor side metered parking zones will be reinvested into infrastructure projects. The City is currently preparing an effort to create a citywide “Parking Benefit District”, which will be a mechanism for reinvesting a percentage of on-street paid parking revenue into economic development projects as well as infrastructure projects. Why aren't there any meters and what are the advantages of using mobile applications to pay for parking? Millions of taxpayer dollars will be saved by avoiding the need for parking pay stations, more collections and maintenance staff, and processing fees. Visitors without a smartphone or data plan can call the toll-free number located on every Parkmobile sign to pay with a credit or debit card over the phone. 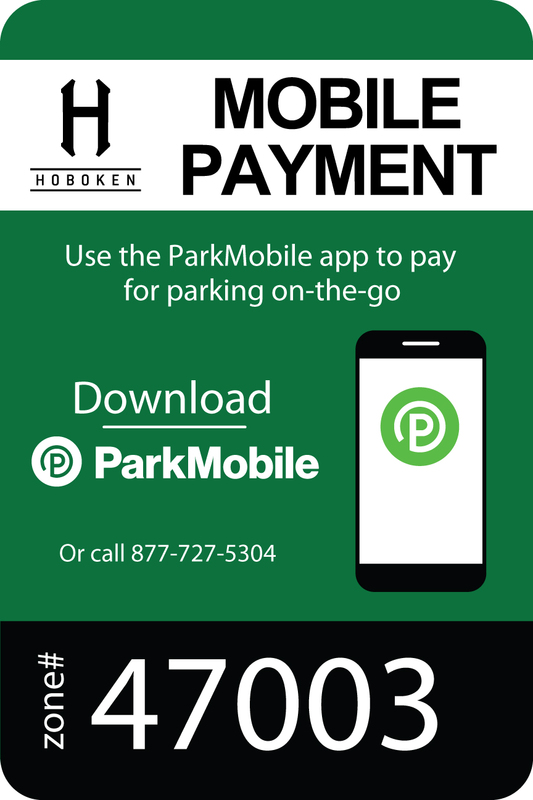 Visitors without a credit card or debit card may obtain visitor parking permits from residents via the Hoboken Parking Utility or they may park in one of the 100+ paid parking zones that have pay stations. Visitors may also park in a garage and pay with cash. How do I download the mobile (Parkmobile) app? You can download the Parkmobile app in the Apple Store or Google Play Store, or by visiting www.parkmobile.com. What if I have Windows Phone or Blackberry? You can pay for parking through the Parkmobile website at www.parkmobile.com. How do I get my parking history or receipts? To view your parking history you can use the Parkmobile app or login to your account on www.parkmobile.com/ The app only shows recent history, which can be accessed by logging in and tapping “sessions”, then “history”. For a full parking history, visit the Personal Pages section on www.parkmobile.com/ Once logged in, click “parking history” from the left navigation bar and adjust the date range if needed. You’ll be able to view previous parking sessions and access monthly statements and receipts. Can I use Parkmobile for handicapped or disabled person's parking in visitor side metered parking zones? Yes. The operator of a vehicle with valid disability license plates or placards must pay for the minimum amount of purchasable time (15 minutes) within the visitor side metered parking zone, then no additional payments are required for the remaining 3 hours, 45 minutes that the vehicle is allowed to park within the zone. After four hours, the vehicle must be moved out of the zone. Can I move zones while in an active parking session? You cannot change a zone number once a parking session is started. If a session has been started in an incorrect zone, please start a new session with the correct zone number. Your vehicle must also be parked within the same zone that was selected upon activating a parking session. How do I set up parking alerts and reminders? Login to the Parkmobile app and tap “more” on the bottom of the screen, then “notifications”. From there you can toggle on or off parking expiration reminders via email, SMS, or push notification. You may setup parking expiration reminders at intervals of 30 minutes, 20 minutes, 15 minutes, 10 minutes, or when 5 minutes prior to your parking session expiring. Will I know that my parking session is about to end? Yes, the Parkmobile app has the ability to send notifications at 30 minutes, 20 minutes, 15 minutes, 10 minutes, or 5 minutes prior to a parking session expiring. Do I need to enter a space number? No, just the zone number which can be found on Parkmobile signs in paid parking zones. What if I encounter a technical issue or see an error message? You can open a support ticket or send an email to helpdesk@parkmobileglobal.com. Be sure to include your mobile number on your account and the details of your experience, including the error message and when you experienced the problem. In the event you experience an error when attempting to activate a parking session, you must pay for parking at the nearest meter. How do I add license plate numbers to my account? Login to the Parkmobile app and tap on “more” on the bottom of the screen, then “vehicles”. From there you, you can add and store up to five license plates at a time. What happens if I get a parking violation that I believe was issued in error? If you believe that you have received a parking ticket in error, please email the Hoboken Parking Utility at parking@hobokennj.gov to schedule a time to meet with a Parking Enforcement Supervisor. Include as much evidence as you can to demonstrate the error, including a photo of the ticket, photos of the parking situation, and your Parkmobile parking session receipt. To view your parking history you can use the Parkmobile app or login to your account on www.parkmobile.com/. Based on the supervisor’s review, they may provide a written report to the municipal court for the judge to take into consideration when making his or her determination. You may still need to schedule a court date and appear in court.